Snyder, Lorraine. "Jonathan (Jon) Riley Montgomery". The Canadian Encyclopedia, 26 March 2014, Historica Canada. https://www.thecanadianencyclopedia.ca/en/article/jonathan-quotjonquot-riley-montgomery. Accessed 23 April 2019. Jonathan (Jon) Montgomery, skeleton racer (b at Russell, Man 6 May 1979). Jon Montgomery is an Olympic gold medal winning skeleton racer. Jonathan (Jon) Montgomery, skeleton racer (b at Russell, Man 6 May 1979). Jon Montgomery is an Olympic gold medal winning skeleton racer. At age 22 Montgomery gained an interest in skeleton while visiting Canada Olympic Park and, half a year later, attending a talent identification camp. In a photo that his parents have cherished, a young Montgomery points to the Olympic rings in the hopes of someday competing at the Olympic Games. He pursued his sport while learning a trade, auctioneering, and began competing internationally in skeleton in 2006, though he would not win his first World Cup until 2 years later. Though he had a brief stint with bobsleigh, winning silver at the 2008 world championships in the team competition, Montgomery chose to focus entirely on skeleton. 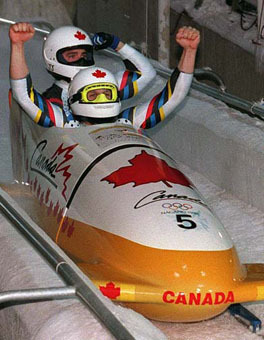 In 2007-08 Montgomery celebrated his most successful season to date, winning a world championship silver medal and 4 World Cup top-3 medals (one gold), and being ranked second in the world by the Fédération Internationale de Bobsleigh et de Tobogganing (FIBT). He won 2 additional World Cup gold medals in the seasons that followed (2008-09 and 2009-10), and going into the 2010 Vancouver Winter Olympic Games Montgomery was ranked fifth in the world. At Vancouver, Martins Dukurs of Latvia, the top-ranked racer that season, was slightly ahead of Montgomery after the first of the 4 runs, but Montgomery gradually closed the distance between them in the remaining 3 runs. 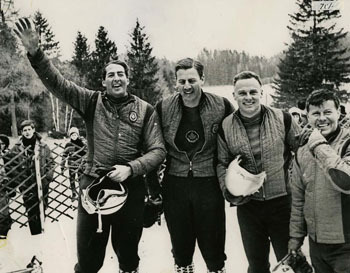 Montgomery finished the 4 runs, reaching speeds of over 145 km/h, in a combined time of 3.29.73, besting Dukurs' time of 3:29.80 and the final time of 3:30.75 by bronze medalist Alexander Tretyakov of Russia. Montgomery's gold medal is the second consecutive Olympic gold medal in skeleton for Canada in the few years the sport has been offered in the Olympic repertoire. (Canadian Duff Gibson won in 2006). Montgomery's exuberance at his gold medal finish was one of the highlights of the 2010 Games. In addition to his career as an auctioneer, Jon Montgomery is an athlete ambassador for Right to Play, an organization that helps underprivileged children participate in sports.